FUSION's STEREOACTIVE is the world's first purpose built watersport stereo. Designed and engineered in New Zealand by FUSION. The STEREOACTIVE is designed for the challenge of life on the water and tuned to deliver crystal clear audio that enchances any activity. 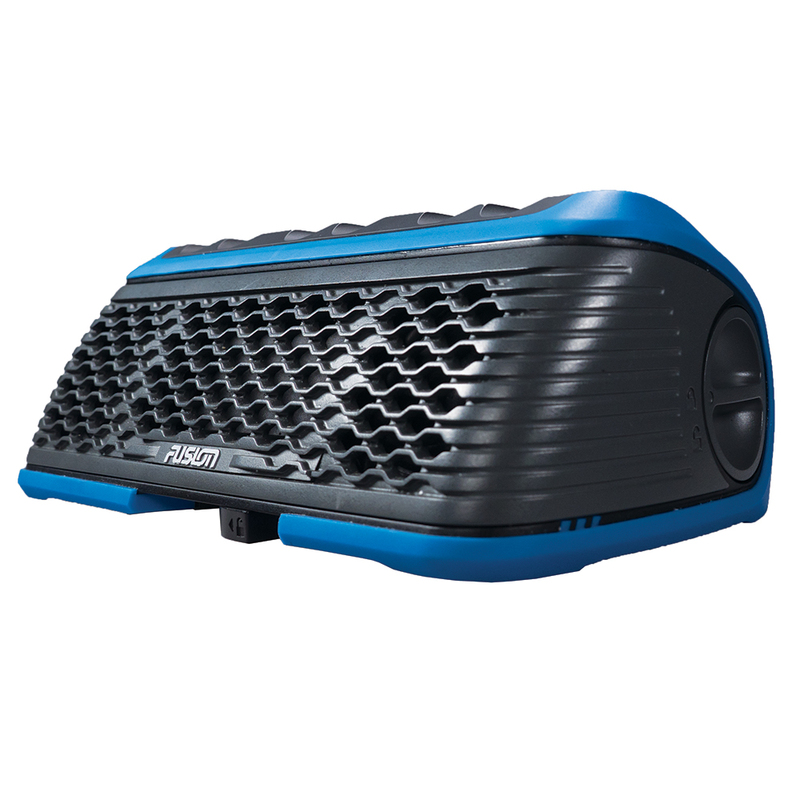 This isn't your standard Bluetooth speaker, this is a fully waterproof portable watersport stereo. Featuring a unique Puck-it Mount system that lets you attach the stereo to any paddle board, kayak, canoe, dinghy/tinny/jon boat or even Jacuzzi. To keep your smartphone safe during your excursion, FUSION has created the ACTIVESAFE which will securely house any smartphone, a standard vehicle key and any loose cards or change. from the water, simply lock it inside the ACTIVESAFE and control the audio from a compatible Garmin smartwatch via Ant. USB flash drive (MP3 playback) inside the STEREOACTIVE, allowing you to enjoy your favorite MP3 tracks while keeping the flash drive safe. If your smartphone is running low on power the USB port provides an emergency charge system (Dependent on STEREOACTIVE battery state). built-in FM/AM tuner. A sophisticated internal antenna enables clear reception and dedicated preset buttons have been allocated on the keypad for your favorite stations. Weatherband available in USA only. Supported regions: Japan, Australasia, Europe, USA. change languages simply visit www.stereoactive.com to download the language update. submersion in up to 1 meter of water for 30 minutes and come back singing. in mind. Whether you're standing on your paddle board or rowing in your canoe, you can always adjust the entertainment with the tap of a paddle. The high grade rubber overmolded key pad is engineered to take a paddling. times while you paddle to the music. Control the Garmin VIRB with the same smart watch used to control your STEREOACTIVE. water. The off axis correction of the polycarbonate grille works perfectly by directing the audio efficiently for crystal clear enjoyment. The powerful 10 watt speaker system boasts enough power to get you motivated on any kayak, paddle board or dinghy/tinny/jon boat. By enlisting a 1st tier battery supplier the high powered lithium ion battery built in to the STEREOACTIVE will keep the music playing for up to 20 hours. Charge technology allows you get back to the fun within 3 hours whether you're charging in the car or a wall socket. *Results may vary depending on listening volume and connecton type eg. BT-USB. The Puck-It is a FUISON designed mounting solution that allows you to securely fit a STEREOACTIVE or ACTIVESAFE to the surface of a paddle board, kayak, canoe, dinghy/tinny/jon boat and even a jacuzzi; leaving you to enjoy your music rather than worrying about losing your stereo to the depths below. solutions, available for smartphone and smartwatch owners. Track your pulse and paddle stroke, and skip to your favorite song from a compatible Garmin smartwatch. Get in the zone to burn calories and set a personal best with FUSION-Link control directly from your wrist. Apple and Android smartphone users can enjoy Bluetooth app control with the free FUSION-Link app available for download from either app store. Tune and save FM pre-sets, navigate USB MP3 music tracks and keep an eye on the STEREOACTIVE's battery level directly from your smartphone. giving you a tidy stereo and storage combo. Just like the STEREOACTIVE, the ACTIVESAFE is designed to float in the unlikely event that it is detached from the Puck-It Mount. ACTIVESAFE floats with your valuables inside, as well as with STEREOACTIVE attached to it.